Spring is undoubtedly one of the most exciting times to be a gardener. A garden full of possibility. A couple of weeks ago we talked about the Big Spring Clean-up in your garden and picked key jobs for you to consider for a high impact spring garden. After the hard work is done, now comes the time for the nice part. Lovely fresh new foliage, a celebration of flowers and new plants to sow and grow. What a wonderful time to be out in the garden. We have chosen 3 nice plants for you to consider to add to your garden. When it comes to jaw-dropping flower displays, it’s hard to beat a JACARANDA. 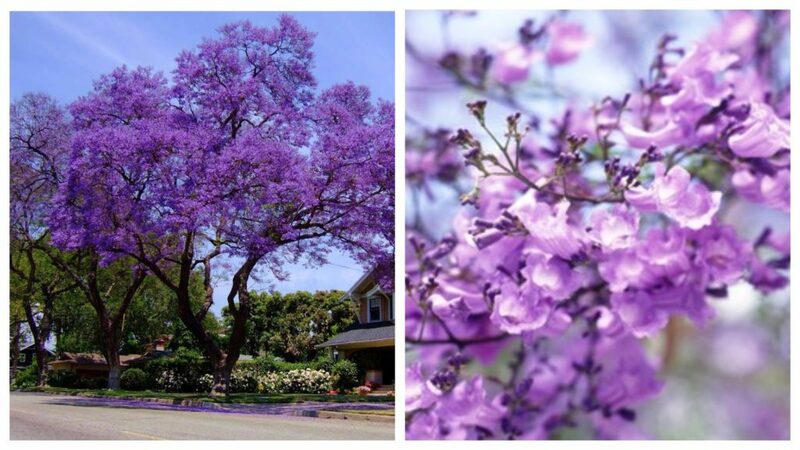 A whole tree, smothered with thousands of purple blooms and not a leaf in sight – stunning! 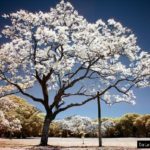 These trees can reach a height of around 10-15m, and a spread of the same size, so you need to be careful where you plant them, as they can extend a long way. Planted in the right spot, a jacaranda is a magnificent shade tree. While jacarandas can be grown from seed, their flower colour varies more and they take longer to flower, but as seedlings often pop up around the base of trees, transplanting them is worth a try and doesn’t cost a cent. And if you’re after something different, hunt down the rather rare white flowering form. The best gardens are places where all five senses come into play. Visual appeal is of course important, and plants that taste good are always welcome. Plus, the sound of water or wind chimes and the feel of velvety leaves add even more dimension. But why not add another sensory element – divinely scented plants? Perfumed plants are one of the easiest ways to transform your outdoor space into an escapist paradise. Scents are also a perfect way to add interest at night when the fading light means you can’t see the flowers and foliage, but you can still enjoy them. 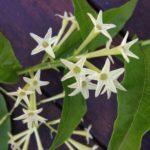 STAR JASMINE (Trachelospermum jasminoides) is an evergreen twiner with thick glossy green leaves and beautifully perfumed, starry white flowers in late spring and summer. 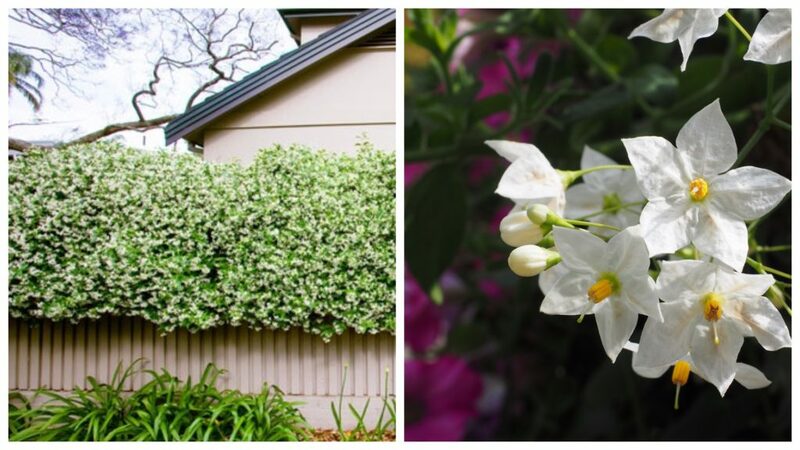 It is moderately vigorous, but it’s not a true jasmine so it will not strangle other plants in the garden. The star jasmine will grow as a climber up fences or lattice work and it’s also a superb ground cover. It can cover the ground quite densely and flower for much of the year. It is very tolerant of sunny, dry positions as well. Alternatively you can plant night jasmine (centrum nocturnum). No smell during the day but heavenly at night! Succulents perform well in extreme conditions and there is no shortage of variations to choose from. The best bet is to visit your local nursery and pick your favourites. 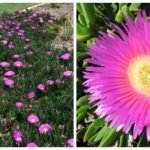 Look out for CARPOBROTUS glaucescens, commonly known as Pigface, Ice Plant, and Hottentot Plant, a native ground cover with huge palm-sized pink flowers that is at home in coastal gardens. It can reach a width of two metres but stays about 20cm tall. It’s perfect for dry spots, sandy soils and hard-to-grow locations. Growing Carpobrotus in planters prevents it from spreading in those areas where that is a concern. Freezing temperatures may cause the plant to die back, but it will resprout in spring in temperate area. 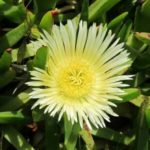 Ice plants are notoriously un-fussy. As long as their soil drains well, the soil is allowed to dry out between watering and the plant receives pinching or pruning to keep it in shape, there is little more to be done. The only serious threats to the plant’s health are spittle bugs and some root rots and stem rots. You can avoid the rot by minimizing overhead watering during periods in which the plant will not dry off before nightfall. The bugs will remove themselves if you spray with a horticultural soap. The yellow blooming form is pretty too.